"Scathing and honest are often interchangeable." First things first... if you are reading this and have not reserved seats, or have a friendly neighborhood subscriber who has one for you, don't delay. 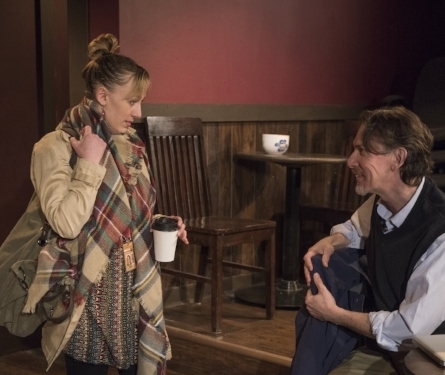 Sold out previews and advance sales have created the perfect storm for the A Red Orchid Theatre world premiere of TRAITOR, written by Brett Neveu and directed by Michael Shannon. The reasons are pretty clear. This is a smart, cleverly conceived, social drama that is creatively staged and bubbling up, top to bottom, with an enormously talented cast, led by founding Artistic Director and Ensemble Member Guy Van Swearingen. World Premiere... TRAITOR is the new era adaptation of Henrik Ibsen's An Enemy of the People, now a contemporary reflection of individual social and moral responsibility and the wide-ranging impact of our decisions on the environment, the community and our families. Rest assured, as serious as all this sounds, there is more than a fair share of outrageously caustic humor to go around. What it's about... East Lake is a town reborn, but it is facing at least two major crisies. One of them is Dr. Tom Stock, a Ph.D. who returned to his hometown to teach high school science and lead the design and development of the community's new economic engine, a state-of-the-art charter school. As the story unfolds, the family is fractured as Stock discloses that the new school grounds are seriously contaminated. Stock is determined to expose the truth publicly, and receives an initial ground swell of support. But his passion is in direct conflict with the interests of others that sets off a series of showdowns with business leaders, the town council and the local press, all leading to the collapse of family trust. Curiously brilliant... if all this sounds complicated, you need to know that the pure enjoyment of this curiously brilliant story is in the telling. Audience and cast are indistinguishable at one point along the way, and this becomes essential to the powerful reckoning. Who stands out... the interwoven connections between Swearingen's perfectly manic Stock, his supportive but frustrated editor/wife Karla, an exceptional role for Dado, and the opposing forces in East Lake, are fascinating. Ensemble members, Kirsten Fitzgerald, commanding in the role of Patty Stock, Larry Grimm, a fine, multi-layered performance as Walter Hove and Natalie West's Jenn Sheffer, who stirs the pot devilishly in her every scene, all add to the emerging pathos. Frank Nall(Howard), Kirstin E. Ellis(Madison), Missi Davis(Molly) and the youthful Nation Hendrickson, making his Chicago debut as Randal, are all stand outs in the cast of 18. How that is accomplished will not be told here. Noble calling... this all felt like the first step of a new adventure. Addressing our moral responsibilities through art is a noble calling. If you want to sit in on that conversation, it is happening right now in the intimate confines of A Red Orchid Theatre in one of the most compelling, imaginative and interesting experiences you will ever have in a theatre.